Contract abstraction and Summarization In the present scenario legal firms, corporate organizations and legal publishing houses all across the globe are entering into hundreds to thousands of contracts on a daily basis, which results into a large, scattered and cumbersome storage of diversified types of legal contracts. As a result, it becomes difficult for the concerned party to keep a track on each and every term and clause that is arising in various contracts. In addition to this the process of physically storing, analyzing, tracking and managing contracts is time consuming, costly and takes a toll on legal skill. 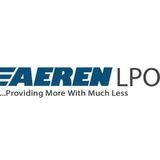 Aeren LPO by using its specialized contract extraction services with the help of latest tools and technologies provides results to itâ&#x20AC;&#x2122;s clients in a cost efficient and time bound manner. Contract abstraction helps in getting a meritorious glimpse of the contract that involves extracting important dates, clauses, and other key information. The aim is to create a system wherein the details of a contract are easily available at a momentâ&#x20AC;&#x2122;s notice, which increases the visibility through the process of creating Meta data fields. It also includes contract calendar, which specifies all the important dates and lays down the duties of the parties, as to which party is liable if certain task is not completed within the specific time frame. 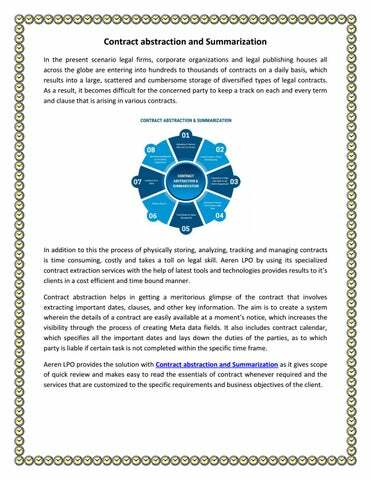 Aeren LPO provides the solution with Contract abstraction and Summarization as it gives scope of quick review and makes easy to read the essentials of contract whenever required and the services that are customized to the specific requirements and business objectives of the client.